Why is Watchamacallit Called Watchamacallit? As a child, I’d often accompany my mom on her grocery store runs. Why? With the hope that we would stand in the check out aisle just long enough for me to convince her to buy me a candy bar. My odds weren’t great, I only succeeded about three times out of ten, but it gave me a lot of time to stare at each of the candy wrappers. 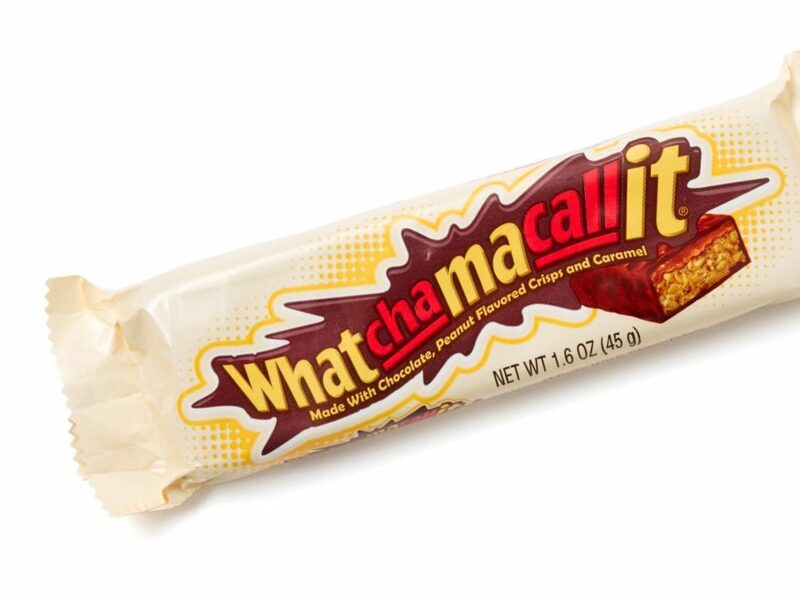 From 1987 to 2008, Whatchamacallit included a peanut-flavored crisp that had peanut butter as the flavoring agent and a layer of caramel, capped off with a chocolate coating. The identical bar is marketed by Hershey’s in Canada as Special Crisp. According to Revolvy, in 2008, the Hershey Company began to change the ingredients for some of its products, replacing the relatively expensive cocoa butter with cheaper oil substitutes. Such cost cutting was done to avoid price increases for the affected products. 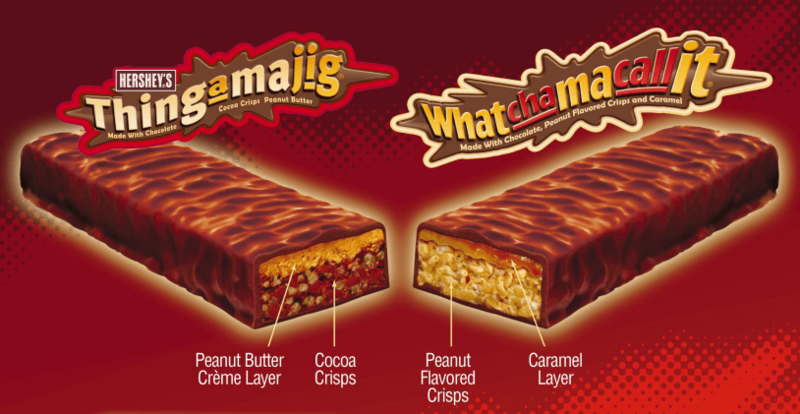 And in 2009, Hershey’s introduced a new bar, following a similar naming strategy, called a Thingamajig, which was a blend of chocolate, peanut butter and cocoa crisps. But, it struggled to take off, so Hershey’s removed it from their product portfolio in 2012. Why is it Called Watchamacallit? So who devised this tongue twister of a name? According to Food52, Patricia Volk, Associate Creative Director at ad agency Doyle Dane & Bernbach, named it in 1978. Assigned to the Hershey account, Volk was in charge of new branding for the company. Though Volk has kept quiet on how she came up with this name, she claimed ownership of it in her 2001 book Stuffed: Adventures of a Restaurant Family, writing, “I did get credit for inventing the name “Whatchamacallit” for a new candy bar.” Although it’s not clear what inspired the name, it’s certainly unique among it’s competitors, but at the same time, it’s challenging to remember. Volk also claims to have named Hershey’s Hugs and Kisses, however she apparently didn’t get credit for that one. From the very beginning, the bar was hardly a shelf stealer. Although Hershey’s ran a series of TV advertisements in the 1980s, featuring hungry truckers and even the bar being stolen by a monster creeping on a camping couple, it just struggled to take off and win the taste buds of your sweet tooth shopper. The candy bar is still being produced, and gets an equal allocation of budget like other Hershey’s products. Even Hershey’s made a case for this in one of their most notable commercials from the 80s with two kids breaking from their baseball game. The catcher comes up to the pitcher and asks, “What do you call it?” The pitcher replies, “Whatchamacallit.” “Whatchamacallit?” he replies. “That’s right?” the pitcher says. Finally the catcher asks, “You forgot the name?” Even Hershey’s admits that the bar isn’t exactly memorable.